Recent major exhibitions in London, Paris, Rome, and Madrid testify to the universality of his appeal. It couldn’t be just the way New York looked in the first half of the twentieth century or the dated look of hotel rooms, of people in offices, staring blankly or dreamily into space, that accounts for such interest. Something lifts the paintings beyond the representational registers of realism into the suggestive, quasi-mystical realm of meditation. Moments of the real world, the one we all experience, seem mysteriously taken out of time. The way the world glimpsed in passing from a train, say, or a car, will reveal a piece of a narrative whose completion we may or may not attempt, but whose suggestiveness will move us, making us conscious of the fragmentary, even fugitive nature of our own lives. 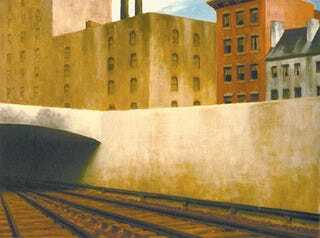 This may account for the emotional weight that so many Hopper paintings possess. And why we lapse lazily into triteness when trying to explain their particular power. Again and again, words like “loneliness” or “alienation” are used to describe the emotional character of his paintings. My own encounters with this elusive element in Hopper’s work began when I would commute from Croton-on-Hudson to New York each Saturday to take a children’s art class in one of those buildings on the south side of Washington Square that were eventually torn down to make room for NYU’s law school. This was in 1947. Just a year after Hopper painted Approaching a City (1946), I would look out from the train window onto the rows of tenements whose windows I could look into and try to imagine what living in one of those apartments would be like. And then at 99th Street we would enter the tunnel that would take us to Grand Central. It was thrilling to suddenly go underground, travel in the dark, and be delivered to the masses of people milling about in the cavernous terminal. Years later, when I saw Approaching a City for the first time, I instantly recalled those trips into Manhattan and have ever since. And Hopper, for me, has always been associated with New York, a New York glimpsed in passing, sweetened with nostalgia, a city lodged in memory.